Being old enough to remember the made-for-TV event that was The Skins Game, I was intrigued about the Tiger Woods-Phil Mickelson ‘Match’ that took place the day after Thanksgiving at Shadow Creek in Las Vegas. In the end, it was a dud on several levels but it does answer (and pose) a few thoughts going forward. B/R Live is a disaster/gong show/goat rodeo. It’s criminal that they have the UEFA Champions League/Europa League rights and have the vast majority of games behind their paywall (with a lot of users complaining about quality). Their announcers and studio crews (on the games they show on TNT) are worse than the idiots on Fox (which is saying something). Their attempt at charging $19.99 for the Tiger-Phil match was worse. In the end, because they couldn’t process payments they opened it up for screening online with no charge which is how yours truly watched it (as of today nearly every provider has provided refunds). My hope is that this puts an end to anyone ever trying the PPV route and that B/R Live ends up swimming with the fishes. Ernie Johnson is one of the nicest people you could ever hope to meet. His story is incredible and I wish him improved health. From all accounts he does a great job at the studio host of TNT’s basketball coverage. Golf, however, isn’t his lane. Too many times he was talking over coverage. Not sure if this was him or the director, but it was bad. When Tiger and Phil are wearing microphones, the second they start talking should be a cue to zip it. Shane Bacon was good in a difficult role. He’s one of a very small list of people on Fox’s golf coverage that aren’t awful. There’s no way they’d feed Joe Buck to the wood chipper (even though he’s terrible), but if I were Fox I’d go with Shane Bacon and Brad Faxon (Paul Azinger’s Grumpy Old Man routine has worn thin). They didn’t sell tickets to the public, and yet, the VIP’s that got in were still yelling crap. Heard at least one Baba Booey and something about Sizzler. So sure glad they kept the unwashed out. The golf itself wasn’t very good. 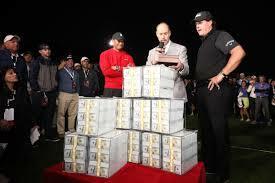 Tiger didn’t seem remotely interested, and Phil was what you’d expect. I mean, if you’re Tiger you’re set for life. The only thing that has to interest him at this point are majors and racking up more Tour wins to add to his ’14 and 80′ tally. The pace of play was horrendous. Tempted to suggest they might want to use carts if there’s a repeat. Way too many talking heads. One lead announcer, one analyst, 1 or 2 on-course reporters and that’s really it. Again…TELL ME SOMETHING I DON’T KNOW OR ISN’T READILY SEEN. I didn’t mind Charles Barkley. Maybe Bacon, Charles, Darren Clarke and Pat Perez on the course. That’s plenty. Shadow Creek was a decent choice as a venue, but several greens appeared to have been aerated recently. Not exactly what you’d hope for. In a previous life I knew a guy in Vegas who thought Shadow Creek was the greatest thing in the world. Bought some giant coffee table book and loved it (back when you had to have a personal invite from Steve Wynn to play there; now you have to be a guest at one of his resorts and willing to pay $500 to play). MGM Resorts was actively promoting hole-by-hole wagering. Didn’t mind it. It’s probably the wave of the future. Spare me the whining about “oh, for $9 million they could have (insert name of worthy cause).” They didn’t. It was never a trade-off. Turner put up the money, they took a bath. Welcome to Commerce 101. The 93-yard playoff hole was interesting. Not a fan but glad they had an option in case of darkness. The HBO 24/7 wasn’t bad. If you’ve seen one, you know what you’re getting. If I were Mike Whan (LPGA Commissioner) I’d try to get the HBO 24/7 team to cover a tour event.